This roundel, together with three others in the Lehman Collection (1975.1.1906, 1975.1.1908, and 1975.1.1909), and two in The Cloisters Collection (47.101.63 and 47.101.64), form part of the same series of early fifteenth-century Franco-Flemish embroideries depicting scenes from the life of Saint Martin. Originally part of a much larger ensemble (thirty-six roundels and panels are now dispersed among public and private collections), the embroideries may have decorated a liturgical vestment, an altar frontal, or possibly a combination thereof, constituting a set of vestments. In this banquet scene, Saint Martin, recognizable by his halo, dines with the Roman Emperor Maximus and the Empress Elen, shown at center, and a priest, at the far right. To the surprise of the guests, instead of offering the cup of wine to the Emperor, Martin passed it first to the priest, deeming it unjust to place the ruler ahead of a clergyman. In the foreground, two attendants dressed in green, assist with the tableware, exquisitely rendered with reflections of light. This roundel is a rare and splendid example of early fifteenth-century Franco-Flemish embroidery. The detailed pictorial design and luminous palette, created by colored silk and metallic threads, highlight the sophistication of this medium, which was so highly prized during this period. 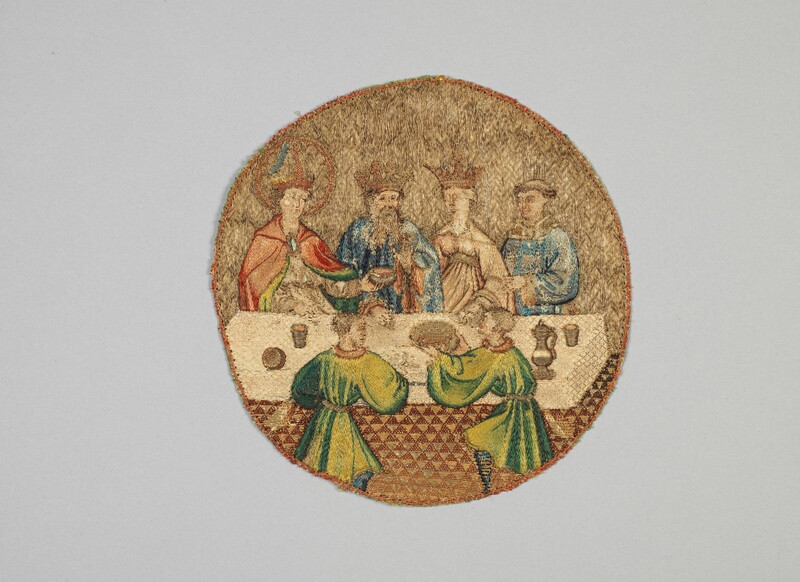 Part of a much larger ensemble, the Lehman roundel and thirty-five additional embroideries formed part of a series depicting scenes from the life of Saint Martin. Six of these pieces belong to the Metropolitan Museum: four are in the Robert Lehman Collection (1975.1.1906, 1975.1.1908, and 1975.1.1909), and two are in The Cloisters Collection (47.101.63 and 47.101.64). The remaining embroideries – including roundels and several arched panels - are dispersed among several public and private collections (Musée Historique des Tissus, Lyons; Cooper-Hewitt National Museum of Design, New York; Walters Art Gallery, Baltimore; Musée National du Moyen Age, Paris; Church of Saint Michael, Ghent). An important figure in Western monasticism, and a patron saint of France, Martin was a highly venerated saint known for performing miracles, as several of the embroideries illustrate. Born in present-day Hungary in the early fourth century, Martin left the Roman army to devote his life to the Christian faith. He lived much of his life in France, where he founded one of the earliest monastic establishments (near Poitiers), and became Bishop of Tours. The episodes depicted in the series were inspired by several accounts of Saint Martin’s life, including a biography composed by his friend and disciple, Sulpicius Severus (ca. 363-425), Jacobus de Voragine's Golden Legend, and the poem Vie de Monseigneur Saint Martin by Péan Gatineau (canon of the church of Saint Martin in Tours in the thirteenth century). The present roundel depicts a banquet scene in which Saint Martin, recognizable by his halo, dines with the Roman Emperor Maximus and the Empress Elen, shown at center, and a priest, at the far right. To the surprise of the guests, instead of offering the cup of wine to the Emperor, Martin passed it first to the priest, deeming it unjust to place the ruler ahead of a clergyman. In the foreground, two attendants dressed in green, assist with the tableware, exquisitely rendered with reflections of light. The early history of the Saint Martin embroideries remains uncertain. The series may have originally decorated an altar frontal (a decorative altar covering frequently made of textile), perhaps arranged in rows or as a frame around a central panel depicting the most famous episode from Saint Martin’s life – his sharing his cloak with a beggar – which is missing from the series. The embroideries may have been assembled on a liturgical vestment, such as a chasuble or cope, either in an allover arrangement, or on orphrey bands (a decorative band placed over a seam on a vestment) or crosses, or both. It is also quite possible that they were assembled on a set of vestments. The most celebrated example from this period is the complete altar set made for the Order of the Golden Fleece, founded in 1430 by Duke Philip the Good of Burgundy (r. 1419-67). Now in the Kunsthistorisches Museum, Vienna, the set consists of an embroidered altar frontal and dorsal, a chasuble, three copes, and two dalmatics. The Saint Martin embroideries were probably removed from their original fabric support in the seventeenth century. It was common practice when a fabric support became worn, or when styles or church decorations changed, to remove such embroideries, and either incorporate them into alternative configurations on new ground fabrics or frame them as individual objets d'art. By the late eighteenth century, the embroideries in Lyons were mounted on two orphrey crosses, each with seven roundels and an arched panel, and two orphrey bands, each with four roundels. Several other pieces from the series, including some of the Lehman examples (and two roundels depicting Saint Catherine, now at The Cloisters, which were once thought be part of the same ensemble) were mounted as an orphrey cross on a chasuble of Renaissance velvet. The Saint Martin embroideries were probably designed by artists (several hands have been identified) from France or the Lowlands during the first third of the fifteenth century. While the identity of the artists remain unknown, scholars have drawn stylistic comparisons with painters and illuminators, such as the Master of the Exhumation of Saint Hubert, the Master of the Roman de la Rose, the Boucicaut Master, Jean van Eyck, Jean Malouel, the Rohan Master, and Rogier van der Weyden. It is likely that a painter/illuminator provided the design for the needlework, which was then carried out by specialized embroiderers. As suggested by the term "needle-painting," the Saint Martin series illustrates the close associations between embroidery and painting. Not only does the Saint Martin series share stylistic parallels with contemporary Franco-Flemish painting and manuscript illumination, but the embroidery technique known as or nué, or shaded gold, produces effects of light and shade, which resemble that of painting. Recently it has been suggested that the five embroidered panels in the series, which differ in style and technique, and probably date to a few years later than the roundels, may represent a collaboration between Barthélemy d’Eyck, a Netherlandish artist active in France, and his stepfather, Pierre du Billant, who were, respectively, painter and embroiderer to René d’Anjou (Duke of Anjou 1434-80, King of Naples 1438-42). One hypothesis is that René may have commissioned the embroideries on the occasion of the marriage of his daughter Marguerite d’Anjou to Henry VI of England in 1444, and subsequently donated them to the Church of Saint Martin at Tours, where the wedding took place. During this period, splendid embroideries were produced at the court of Burgundy. The dukes of Burgundy ruled over territories in present-day France and the Lowlands from their capital in Dijon and were significant patrons of the arts. While the patron of the Saint Martin series remains unknown, Philip the Good of Burgundy (r. 1419-67) is one of several possible patrons, all of whom are known to have commissioned costly embroidery. The others include Pope Martin V (r. 1417-31), the Saint’s namesake, as well as King Charles VII of France (r. 1422-61) and René d’Anjou, who were devoted to Saint Martin. The embroideries may have been intended for a set of vestments for the Basilica of Saint Martin at Tours, the site of the Saint’s tomb, or one of the many other churches dedicated to him. The Saint Martin series was embroidered with colored silk and gilt-silver metal threads on a linen ground employing the sophisticated or nué technique, used frequently in Flanders and Italy. With this technique, metal threads were held in place (or "couched") with colored silk threads, and, depending on the placement of the stitches, different patterns were created. The metal strips were cut from a foil (a silver alloy containing 95% silver and 5% copper), gilded on one side and then wrapped around a yellow silk core. Gilt-silver metal threads were also used to create small design elements such as the bowl and the carafe in the roundel portraying Saint Martin Offering the Wine Cup to the Priest. Laid down in parallel lines on a shaped padding underneath and stitched to the linen background at their extremities, they create the impression of three-dimensionality. While the gilt-silver metal threads enhance the luxuriousness of the embroidery, the fine-colored silk threads create a sense of volume in the figures. The combination and the color gradation of the silk stitches (satin, split, and stem) modulate the tones and emphasize details of the facial features and vestments, thereby producing a needle-painting effect. Eisler, Colin. "Two Early Franco-Flemish Embroideries: Suggests for Their Settings." Burlington Magazine, vol. 109 (1967), pp. 571-580. Freeman, Margret B. The St. Martin Embroideries: A Fifteenth-Century Series Illustrating the Life and Legend of Saint Martin of Tours. New York, 1968, pl. 17. Gómez-Moreno, Carmen. Medieval Art from Private Collections: A Special Exhibition at The Cloisters. Ex. Cat: New York: Metropolitan Museum of Art, 1969-69. Schrader, J.L. The Waning of the Middle Ages: An Exhibition of French and Netherlandish Art from 1350-1500 Commemorating the Fiftieth Anniversary of the Publication of The Waning of the Middle Ages, by Johan Huizinga. Exh. Cat: University of Kansas Museum of Art (now Spencer Museum of Art), Lawrence, Kansas, 1969, under no. 122. Thurman, Christa C. Mayer. Review of Margaret Freeman. The St. Martin Embroideries: A Fifteenth-Century Series Illustrating the Life and Legend of Saint Martin of Tours. New York, 1968, in Art Bulletin 55 (1973), pp. 628-30. Bober, Harry. "Medieval Objects." in The Guennol Collection. vol. 1, by Ida Ely Rubin, New York, 1975, pp. 242-52. Levin, William R. Images of Love and Death in Late Medieval and Renaissance Art. Exh. cat: Ann Arbor: University of Michigan Art Museum, 1975-6, under no. 61. Carlano, Marianne and Larry Salmon. French Textiles from the Middle Ages Through the Second Empire. Hartford, Connecticut: Wadsworth Antheneum, 1985, p. 80, n. 28. Reynaud, Nicole. "Barthélemy d’Eyck avant 1450." Revue de l’art 84 (1989), pp. 22-43. Grönwoldt, Ruth. Strickereien von der Vorzeit bis　zur Gegenwart: aus dem Besitz de Württembergischen Landesmuseums Stuttgart und der Schösser Ludwigsburg, Solitude und Monrepos. Munich, 1993, pp. 36-39. Reynaud, Nicole. "Une broderie de l’histoire de Saint Martin: Barthélemy d’Eyck et Pierre du Billant?" Revue du Louvre et des musées de France 47, no. 3 (1997), pp. 37-50. Synge, Lanto. Art of Embroidery: History of Style and Technique. Woodbridge, Suffolk, 2001, p. 54. Thurman, Christa C. Mayer. European Textiles in the Robert Lehman Collection. Vol. XIV. New York: Metropolitan Museum of Art, New York; Princeton: Princeton University Press, 2001, pp. 44-57, cat. 16. Ferré, Rose-Marie. René d’Anjou et les arts: Le jeu des mots et des images. Turnhout, Belgium, 2012, p. 170. [Duponchel, France (? )]; [Giuseppe Salvadori, Florence]; Joseph Brummer, New York; Brummer sale, Parke-Bernet, New York, part 1, 20-23 April 1949, lot 511, ill.; [Rosenberg and Stiebel, New York]; [Lock Galleries, New York]. Acquired by Robert Lehman from Lock in 1949 along with Nos. 13-15, 17, 18.